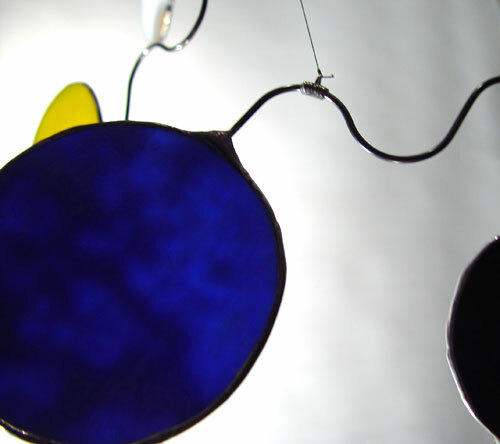 This kinetic suncatcher features two deep blue stained glass circles with yellow, black and white glass circles. This mottled blue glass measure 4 inch in diameter each and largest arm length is 13 inches. This stained glass mobile height is approximately 17 inches. Truly a fantastic hanging mobile fasten to the ceiling over your computer. Looking up and refocus your eyes on your glass mobile will help reduce monitor eye strain.